Vanguard Charitable is a top U.S. grantmaking organization that fulfills its mission to increase charitable giving by sponsoring donor-advised funds--a tax-effective way to consolidate, accrue, and grant assets to charity. Since our inception in 1997, we have helped donors fulfill their philanthropic goals and make lasting charitable impacts. We are proud to offer the highest value donor-advised fund, a claim backed by our low all-in fee and strong alignment with the time-tested principles of Vanguard, a leader in at-cost investments. 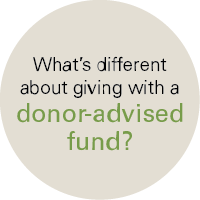 For more information on charitable giving or donor-advised funds, visit our Resource Center.